A fused dichroic donut glass pendant from layererd pieces of scrap glass. There is no set pattern for this style of pendant as it is very much whatever abstract idea you come up with. 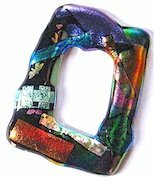 In this design dichroic forms the top layer, plain fusing glass can be used instead of dichroic. 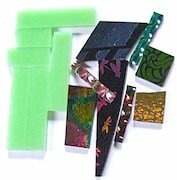 Colored frit may also be used on top of opaque fusing glass to give a different finish. Pendant can be any size from small to large. You will notice from the side photo, lengths of green fusing glass, these form the base and the dichroic lengths are laid on top and the pieces then fused together. The base can be laid out at varying angles to achieve the desired shape. Different shapes are then overlaid on top of the base. After cutting the pieces, make sure they are cleaned and dried completely. Load onto a primed kiln shelf, or use shelf paper instead. Place the shelf into a fusing kiln and leave it vented if using shelf paper, bring the temperature gradually up to around 1000 F until the binders have burnt off. Close the vent, take the temperature up to around 1450 to 1550 F. Wearing dark kiln safety glasses check the fusing process to ensure the item doesn’t over fire. Once you are happy with the process, turn the kiln off and allow it to cool down to room temperature.The pendant can be finished off by gluing a bail to the back of it or use a leather thong to suspend the pendant around your neck. Experiment with colored glasses and fuse different designs, the combinations and shapes are virtually endless.